I have been sewing up a storm lately. There are just so many things I want to make. Pinterest may have a lot to do with that lol. Not like I don’t already have enough for Little Miss, but hey, it’s fun. This is her new doll bassinet. It turned out lovely if I do say so myself. 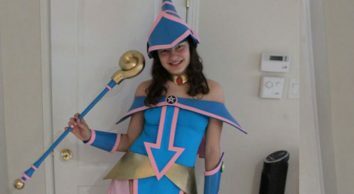 This would probably fall under a medium sewing level for this project. 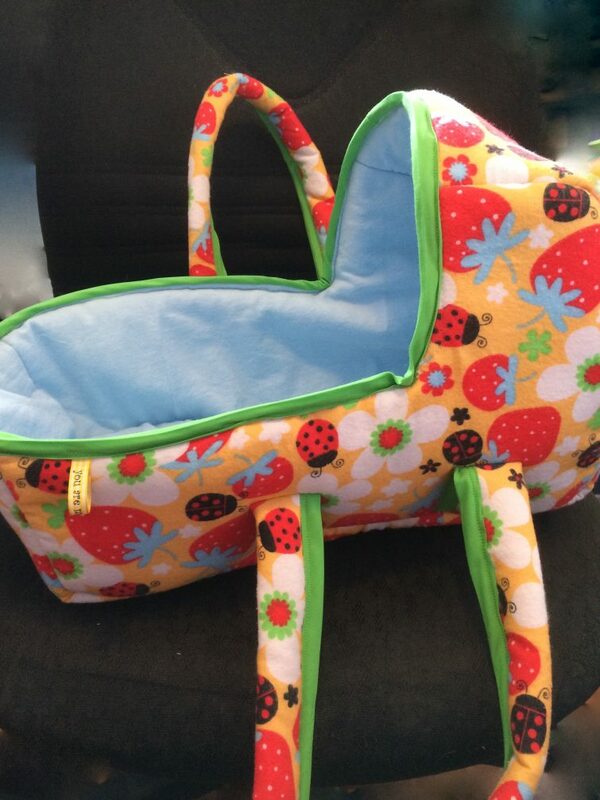 The pattern has 3 different size options, is easy to follow and even includes a blanket, pillow and mattress. 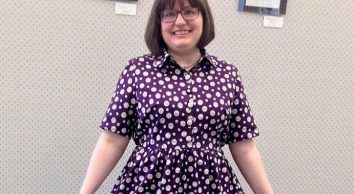 You can find the pattern at Dana Made it for $8. It is well worth the money really. I used Printed Micro Chenille-Confetti-Coral for the mattress with green Dimple Micro Chenille on the opposite side. 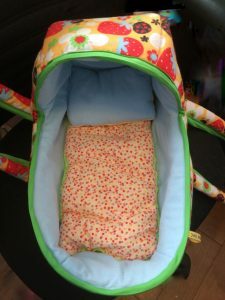 For the pillow and inside of the bassinet I have basic blue flannelette and Bella Uccello-yellow on the opposite side of the pillow. I found all of this as well as the green bias tape at Fabricville (also available online). The outside shell is from a fabric given to me so I am not sure where it was purchased. 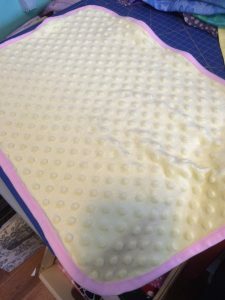 Blankets are super easy and look quite nice and finished with some bias tape on them. I already had some cut but hadn’t thought about the bias addition until I came across it in the pattern for the doll bassinet. 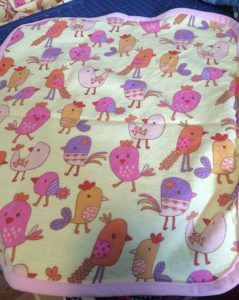 I used Dimple Micro Chenille in yellow and Be Happy Printed Flannelette-Birds-Tangerine with pink bias tape, all from Fabricville and available online as well. 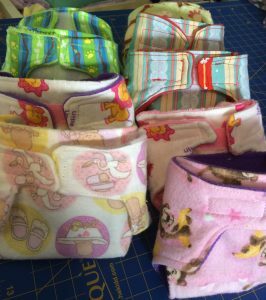 I also came across a few patterns for doll diapers again so I thought I would give them another shot. There are so many different size dolls! It is hard to get a one size fits all style. 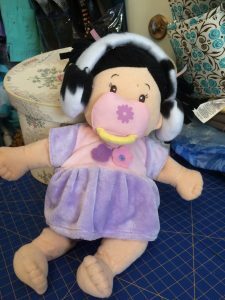 Plenty of free patterns online. These will do I’m sure. I used whatever scraps of flannel and cotton I had for these. 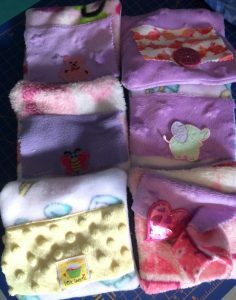 I also made some little baby doll wipes with cases. They didn’t turn out as well as I had hoped but good enough. You can find many free patterns for this online. There are about 6 wipes in each of them as well. There are more than enough for some of her cousins and friends. I used scraps of Micro chenille and fleece to hopefully not have to do any finished seams. 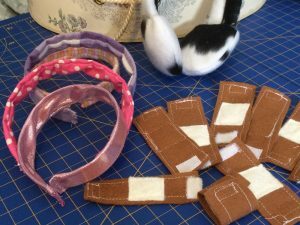 These doll headbands are quick and easy as well as the ear muffs. They turned out cute.. Enough for a few littles. I got the idea for this here. 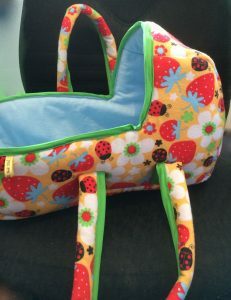 Fabric used: Fabricville- Fleece Skin Prints-Dairy Cow-Cream/black. There is a lot of quick tutorials for the Band-Aids available online. I didn’t use any one in particular. She will love these, as will some of the other little cousins and friends. Brown and white felt are used for these. Isn’t this just the cutest idea. 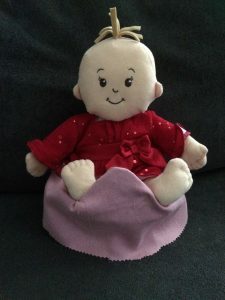 Its a doll/teddy potty. We recently got a new video on potty training and of course it features a teddybear so my Little Miss decided that her teddy and dolly needed a potty to so……Mommy made one lol. Get the full tutorial at Inspiredbymomxoxo.com. Any fabric will do. 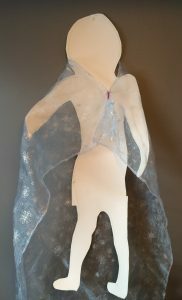 My Little Miss calls this her Elsa cape. Whenever she watches the show she puts this on and some gloves lol. I just cut out a square of this pretty fabric and put a piece of velcro on it with a bow. I didn’t want anything stronger to fasten it.